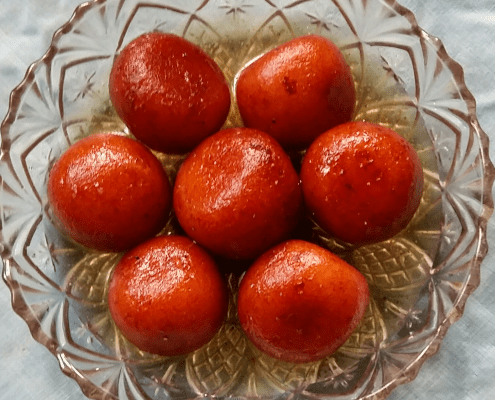 Gulab Jumun is a very popular dessert in India. It is soft in texture and very delicious. This sweet and tasty dessert is made on festivals, weddings, on major celebrations in the family like birthday parties, anniversary parties, get-togethers, etc. Soak saffron in 1tsp milk for 5 minutes and then crush it. In a heavy bottom pan, take sugar and water. Place the pan on heat, keep stirring the mixture till sugar dissolves. When mixture starts to boil, lower the flame. Add 1 tbsp milk to the mixture and continue to boil without stirring. Scum will collect on the sides of the pan, remove it gently with a big spoon. The syrup will be ready in 5 minutes. Make sure that the syrup is little sticky. Switch off the flame, add cardamom powder and saffron to the syrup. Adding saffron and cardamom powder gives a very nice flavour to the dish. While making gulab jamun, many times a hard lump forms in the centre. But if we put 1 or 2 diamond sugar in the centre of each gulab jamun, this will not happen. Take gulab jamun mix and khoya in a plate and mix properly with hands. Now add milk as neededd and make soft dough. Apply some ghee on it and cover the dough and keep it aside to rest for 5 minutes. Chop cashewnuts into small pieces. Apply ghee on palms, take dough, flatten it and stuff 1 piece of chopped cashewnuts, 1 raisin and 1 diamond sugar inside. Shape it into small, round, smooth surfaced ball, make sure there are no cracks on the surface of the ball. Heat ghee in a wok. When ghee is medium hot, put one small piece of dough in it and if it comes up immediately, the ghee is ready for frying. Fry jamuns on medium heat. At a time you can fry 4 to 5 gulab jamuns. Keep stirring with a spoon and when gulab jamuns are golden brown in colour strain them out on absorbent paper. Put gulab jamuns in hot sugar syrup, leave it for half hour. Serve gulab jamuns hot, cold or at room temperature. Those gulab jamuns look yummy! And the tip of stuffing with a sugar candy piece is useful indeed! Is there some other dish than gulab jamuns that we can make with the mix? soon I will share recipe.